This article is about the character from The Super Mario Bros. Super Show!. For the event from Paper Mario: The Thousand-Year Door, see Bingo!. Bingo is a Mushroom inhabitant of the island of Waki-Waki, the leader of which, Scooter, he appears to be friends with. In The Super Mario Bros. Super Show! episode "Too Hot to Handle", Bingo aids Scooter in his attempt to throw Princess Toadstool into the volcano of Waki-Waki, in an attempt to appease the Fire God (in actuality, King Koopa, who had disguised himself as the Fire God) who had ordered Princess Toadstool to be thrown into the volcano at sundown, under threat of destroying Waki-Waki. It was only when he and Scooter were about to throw Princess Toadstool into the volcano that Bingo remembered that the Fire God had ordered them to throw Princess Toadstool into the volcano at sundown and subsequently reminded Scooter of this; not wanting to disobey the Fire God and make him angrier, Scooter and Bingo decided to simply wait until sundown to throw Princess Toadstool into the volcano, which greatly annoyed King Koopa. Eventually getting an idea, King Koopa told Scooter and Bingo through a microphone that it was sundown, tricking the gullible Scooter and Bingo into throwing Princess Toadstool into the mouth of the volcano, despite Mario, Luigi and Toad's protestation. Later, after defeating King Koopa and Fryguy, Mario, Luigi, Toad and Princess Toadstool revealed to Scooter and Bingo, as well as the rest of Waki-Waki's inhabitants that they had been deceived. 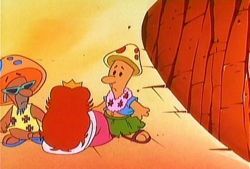 Apparently forgiven by Mario, Luigi, Toad and Princess Toadstool for his actions, Bingo appeared at the spaghetti luau that was thrown in their honor by the real Fire God of Waki-Waki, who was freed from his imprisonment by King Koopa and Fryguy. This page was last edited on October 1, 2018, at 21:26.